I just saw this question and that got me to this NASA page which led me to this scientific article. “Our other discovery is a real oddball and has an orbit like no other known Jovian moon,” Sheppard explained. “It’s also likely Jupiter’s smallest known moon, being less than one kilometer in diameter”. This new “oddball” moon is more distant and more inclined than the prograde group of moons and takes about one and a half years to orbit Jupiter. So, unlike the closer-in prograde group of moons, this new oddball prograde moon has an orbit that crosses the outer retrograde moons. As a result, head-on collisions are much more likely to occur between the “oddball” prograde and the retrograde moons, which are moving in opposite directions. 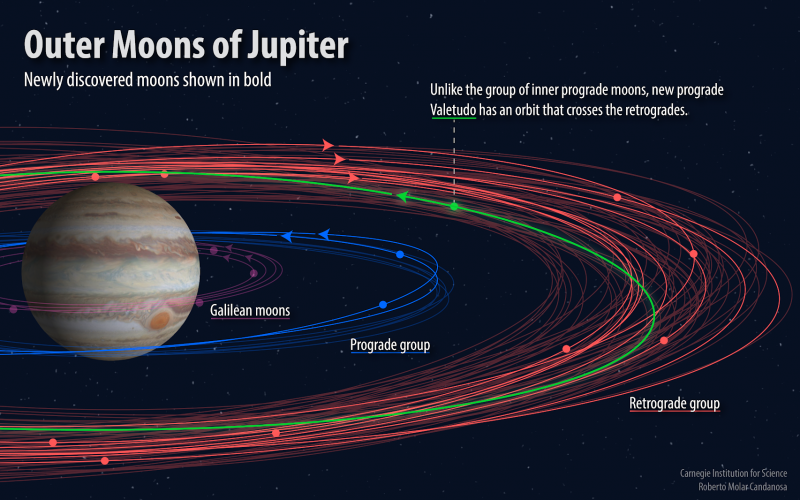 My question is, why are most of the moons that are further away from Jupiter retrograde orbits, while the ones extremely close to Jupiter are prograde orbits? What possible situations were required for Valetudo to end up where it is opposed to where the rest of the pro-grade moons are clustered? Pure chance / a series of unlikely events? My questions are: 1.: why are most of the moons that are further away from Jupiter retrograde orbits, while the ones extremely close to Jupiter are prograde orbits? 2.: What possible situations were required for Valetudo to end up where it is opposed to where the rest of the pro-grade moons are clustered? Pure chance / a series of unlikely events? Answer 1. Inner moons usually orbit in the same direction as the rotation of their parent planet, this is favored due to one means of their formation, and the effect of tidal forces if they were close to the planet and in a retrograde orbit. : "Formation of the Galilean Satellites: Conditions of Accretion" (Dec 2002), by Robin M. Canup and William R. Ward. : "Chaos-assisted capture of irregular moons" (May 2003), by Sergey A. Astakhov, Andrew D. Burbanks, Stephen Wiggins, and David Farrelly. Answer 2. It is possible that Valetudo was a binary companion and was captured in an exchange reaction. "These moons were probably captured by Jupiter from solar orbits." "... exchange reactions during planet-binary encounters (i.e. ~ an encounter in which one member of a binary is expelled and its place taken by the planet) represent a new pathway for the capture of planetary satellites. This new capture mechanism may be relevant to origin and evolution of several small body populations in the solar system (e.g.~the icy and irregular satellites of the giant planets). Additional Info: Robert Walker explains and offers this image showing how contact and overcontact binaries, ternaries, quarternaries, etc. can form stable and unstable systems. Those can be torn apart by the tidal forces of larger (even smaller) objects. Not the answer you're looking for? Browse other questions tagged orbit jupiter natural-satellites or ask your own question. How was Io not torn apart by tidal forces during its formation? Why do Jovian moons fade when transiting Jupiter's shadow? Is the Sun prograde or retrograde with respect to the rotation of the Milky Way? 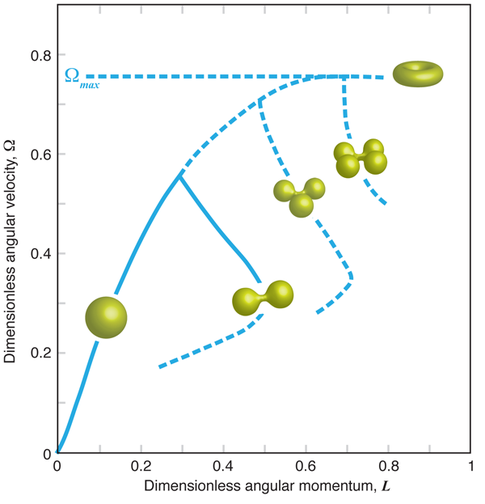 How can tidal heating lower Io's orbit? Is it possible for a planet to have multiple moons in a nearly stationary orbit?